the villa is 600 square meters. where luxury apartments have been created with a private swimming pool of unique charm, equipped with all possible comforts, furnished with modern furniture in contrasting effect with other antique furniture of prestigious workmanship. The flooring, made with natural larch wood boards, treated as in the past with natural organic oils and waxes, with the exception of paints and chemical products. We have obtained an aesthetic result from the unique warmth, and a guarantee of quality and well-being for those who live in the house. Also the outdoor area is fully furnished with parasol equipment, sun beds, the table for outdoor dining in the silence of the countryside. The first services (supermarket, bakery, church, etc.) 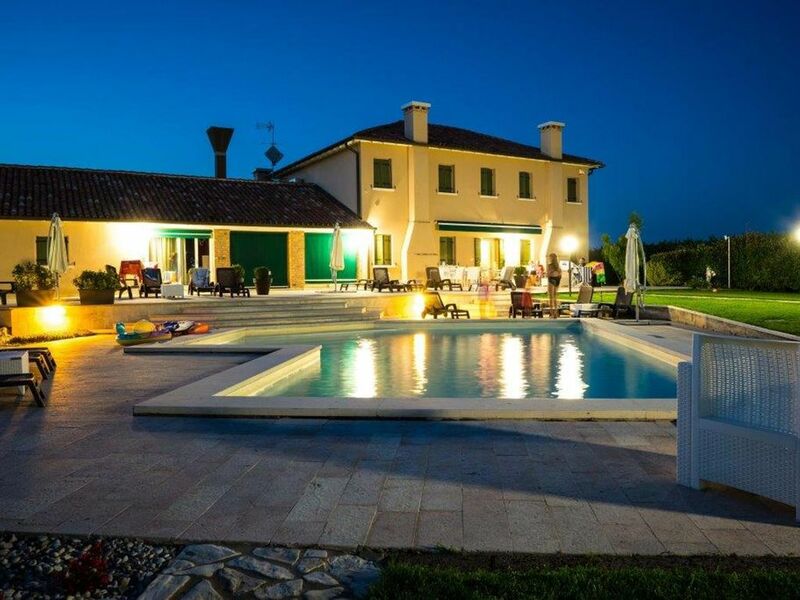 are located 2 km from the house (3 minutes by car) in the small village of San Pietro with a unique choreography due to the simplicity of the local people, or in the picturesque city of Chioggia where in 10 minutes you reach the shopping centers of all kinds. If you prefer the evening socialite, in 10 minutes you will be in the city of Chioggia ... the PICCOLA VENEZIA in land, where the choreography of the place will involve you with unforgettable sensations. Chioggia is the "other Venice", which contends to the capital the primacy of the most distant origins and which maintains a more lively and full of life dimension; Chioggia is the 'capital' of the Venetian lagoon for the economies, trades and society that have taken root over the centuries; Chioggia is the shoreline that more than any other combines originality, beauty, natural health with consolidated traditions, lived and reinterpreted, and with an urban dimension, an invaluable cultural and architectural heritage to be discovered. These are aspects and dimensions that, once they are inside, can amaze and amaze anyone. The genuineness and spontaneity of the people of Chioggia offer a thousand reasons of interest: from art to folklore, from the beach to meeting places and in particular to a genuine and peculiar gastronomy. The sea with beautiful beaches of fine sand with a 'wide and cozy foreshore ideal for long walks and to entertain children and relax the older ones. Lakes with pristine waters among enchanting mountains. Chioggia and Sottomarina, with its 50 thousand inhabitants, is the sixth city in the Veneto region for the number of inhabitants already capital of salt in the Middle Ages, the second town of the Dogado della Serenissima and currently one of the largest Italian fishing centers, is located at the southern end of the Venice Lagoon, in a singular landscape and environmental site, which Unesco in 1987 has included in the list of world heritage. Its territory is crossed by three of the most important rivers of Italy: the Adige, the Brenta and the Bacchiglione and it is the natural terminal of the Padana hydro-fluvial navigation network. It includes one of the deepest beaches of the Adriatic (the beaches of Sottomarina and Isolaverde) and an ancient forest of pines and oaks, the Bosco Nordio, bound since 1971 to the Integral Nature Reserve, the last trace of Mediterranean scrub. 4 SQM REFINED BATHROOM WITH MOSAIC COVERING WITH SHOWER BOX. Nach einem miserablen Start in den Urlaub (Unfall bei der Hinfahrt) machten die Vermieter Guerrino und Antonella durch ihre kompetente und fürsorgliche Unterstützung den Urlaub doch noch zu einem wunderbaren Erlebnis. Danke nochmals fürcdiecweit mehr als selbstverständliche Hilfe und all die erfahrene Herzlichkeit und Unterstützung. Wir kommen gerne wieder. Acceuil chaleureux, habitation très soignée et propriétaires très attentifs à toutes nos attentes. Nous le recommandons fortement à toutes les personnes souhaitant être au calme dans une maison idyllique et proche de grandes villes. Pour nous un séjour inoubliable! Meget flot og ikke mindst velholdt ejendom, hvor der er styr på det hele og ejerparret sikrer at det hele fungerer, så man "kun" skal koncentrere sig om at holde ferie og slappe af ved poolen som er dejlig. Godt tænkt med "egne" solbænke og parasol på fast plads, og med fire lejligheder rigeligt med plads til alle til bare at nyde ferien. Kan absolut anbefales og ligger lidt landligt med fred og ro, men med tæt på dejlig strand ved Adriaterhavet kun 20 minutter væk og 45 minutter fra Venedig. Mooi verblijf, aangename en behulpzame eigenaar.